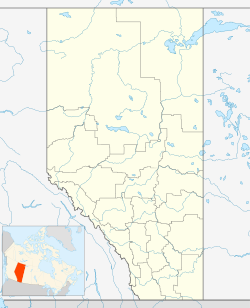 Nampa is a village in Northern Alberta located 27 km south of the Town of Peace River, along Highway 2. Heart River crosses the Highway 2 just north of community. Canadian National Railway owned railway traverses the village. In the 2016 Census of Population conducted by Statistics Canada, the Village of Nampa recorded a population of 364 living in 156 of its 176 total private dwellings, a 0.6% change from its 2011 population of 362. With a land area of 1.71 km2 (0.66 sq mi), it had a population density of 212.865212.9/km2 (551.319551.3/sq mi) in 2016. In the 2011 Census, the Village of Nampa had a population of 362 living in 164 of its 169 total dwellings, a 0.6% change from its 2006 population of 360. With a land area of 1.86 km2 (0.72 sq mi), it had a population density of 194.624194.6/km2 (504.073504.1/sq mi) in 2011. The population of the Village of Nampa according to its 2007 municipal census is 373. The economy of Nampa is significantly dependent on agriculture and associated services. Great Northern Grain Terminals, a privately owned and operated grain company that was established in 1986 has a 77,200 MT terminal in Nampa. Peace River Timothy Processing Plant operates a timothy hay growing, harvesting, baling, dehydrating and double compression plant in the community. The plant specializes double compressed timothy hay for export to Asian markets such as Japan. Nampa Co Op Seed Processors provide seed cleaning services. Forestry and oil and gas industries are also a part of the Village of Nampa economy. Boucher Brothers Lumber Mill near Nampa produces dimensional lumber between 1x3 to 2x10 in 16-foot (4.9 m) lengths for Alberta construction market. Lying adjacent to the Peace River Oilsands, Nampa also sees some oil and gas activity. The Village of Nampa is governed by a mayor (Perry Skrlik), deputy mayor (Dale Gach) and three councillors who meet once a month. It is currently located in the Peace River Federal Electoral District, and as such is represented by Chris Warkentin; in the next federal election it will become part of the new riding of Peace River—Westlock. Parks and recreational areas in close proximity to the community of Nampa include Wilderness Park The Heart River Golf Course is just north of the village. Green Valley Provincial Park to the northeast in the Heart River valley extends from Nampa to the Town of Peace River providing an important corridor for wildlife. Nampa Public School provides education for students from Kindergarten to grade 6. Secondary school students are transported to the Town of Peace River. Nampa is served bi-weekly by alternative newspaper The Vault Magazine. ^ Discover the Peace Country. "Village of Nampa". Retrieved 2010-10-17. ^ "Location and History Profile: Village of Nampa" (PDF). Alberta Municipal Affairs. October 21, 2016. p. 491. Retrieved October 23, 2016. ^ a b c "Population and dwelling counts, for Canada, provinces and territories, and census subdivisions (municipalities), 2016 and 2011 censuses – 100% data (Alberta)". Statistics Canada. February 8, 2017. Retrieved February 8, 2017. ^ "Population and dwelling counts, for Canada, provinces and territories, and census subdivisions (municipalities), 2011 and 2006 censuses (Alberta)". Statistics Canada. February 8, 2012. Retrieved February 8, 2012. ^ Alberta Municipal Affairs (September 15, 2009). "Alberta 2009 Official Population List" (PDF). Retrieved September 12, 2010. ^ "Nampa - Mayor and Council". Retrieved 2014-12-31. ^ "Map of Peace River Electoral District". Retrieved 2014-12-31. ^ "Chris Warkentin's Website". Retrieved 2014-12-31. ^ "Map of Peace River-Westlock Electoral District". Retrieved 2014-12-31. This page was last edited on 29 November 2018, at 19:08 (UTC).